Success comes in bunches for Trinidadian Ronnie Nelson, Jr. After scoring victories in the December Junior Orange Bowl in Miami, "RJ" returned to successfully defend his titles in the National Championships on January 13th-14th. His blistering 7-0 score left the nearest competition in the dust. "Indeed he has earned the title in the midst of Trinidad and Tobago Carnival season, the Chess Monarch," claimed his mentor and aunt, Lesley-ann Nelson. 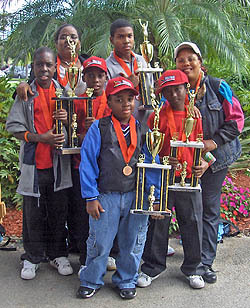 Last month in the Junior Orange Bowl, Kids' Chess teammates Kevin Mahabir, Keno Samuel and Akeenie Murray took 3rd place in the team event for the 10-13 age category. The team was chaperoned by Ms. Nelson and sister, Mureen Nelson. RJ took the under-6 title in the individual event. At the Miami Winter Championships, RJ again placed first in the under-6 and took third in the concurrent under-9 with 5½ points behind Tewana Mellace of Jamaica and Omari Teka of Barbados. Trinidadian contingent victorious at the 2007 Orange Bowl in Miami. Photo courtesy of Lesley-ann Nelson. Indeed he has earned the title in the midst of Trinidad and Tobago Carnival season, the Chess Monarch." The Nelsons would like to extend thank to Jaye -Q Baptiste of the Jaye-Q Show, Mr and Mrs. Attong, Rosalyn Saint Bernard and the Nelson Family. To our media persons on 96.1 talk, Ruskin Mark of N.C.C., Jaye- Q , CNC3 and Valentino Singh of the Guardian. The principal and staff of Tunapuna Boys' R.C. School. More information can be source about this star at www.saveourchildrenfoundationtnt.org.Persons wishing to be part of the Kids' Chess Academy, can call (868) 775-2358. Check out YouTube video of "The Chess Monarch"